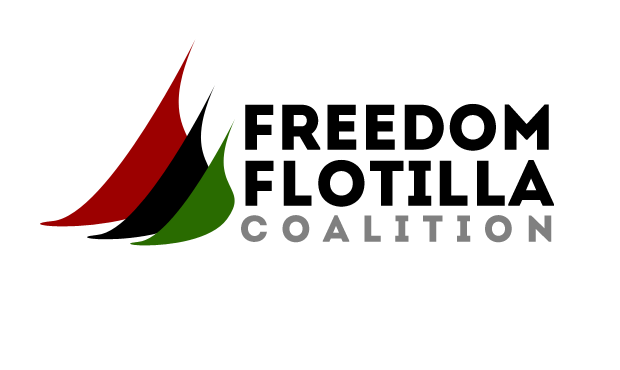 The Freedom Flotilla Coalition (FFC) is launching a new project and we need your help to DESIGN A LOGO! The Israeli Occupying Forces (IOF) restrict fishers in Gaza to a maximum of six nautical miles from the shore. People fishing beyond this arbitrary border risk being shot at by the Israeli Occupying Forces, having their boats stolen, and dehumanized by the IOF, who regularly force them to undress and swim to the IOF military boats. In the past 30 days there have been over 20 attacks on Gaza fishers which largely go unreported in the mainstream media. Fishing is a major source of food and income for the Palestinian people of Gaza and yet it is being seriously eroded. Flags/banners being flown in solidarity with Gaza fishers… this is where you come in! Our new project needs a logo that reflects the values of the FFC and that will become a symbol of solidarity and hope with Gaza fishers for use in solidarity events around the world. Please submit your entry to mediawbg@gmail.com by 15 April 2017. The FFC will select the winning design or designs and will then notify all applicants of its decision. Gaza has been under Israeli blockade for the past decade during which Israel has also launched countless attacks against the besieged population, turning their life into a nightmare and a continuous struggle. Through Freedom Flotillas and other naval missions we have brought international attention to the suffering and the resistance of the Palestinian people of Gaza. The FFC seeks not only to challenge the Israeli blockade but to also show solidarity and bring a message of hope to the Palestinian people. With the support of women, men, non-governmental organizations and civil society groups we will make this happen. FFC is composed of civil society organizations and initiatives from many countries. We have been challenging the illegal and inhumane Israeli blockade of Gaza for years and are committed to continue the struggle until the blockade is unconditionally lifted and Palestinian people everywhere regain their full rights. Please help spread the word by sharing and forwarding this message widely!